Integrated Development Environment (IDE), designed for the cloud. Essentially a pair of digital x-ray goggles, which youth can use to see through the surface of any web page to view the underlying HTML code. The tool allows them to play with and easily modify the code and instantly understand how modifications affect the content and appearance of the web page. In this way, youth can hack into, rewrite and remix any piece of online content from within their local computer browser--and even share remixes with friends--without altering the source code on which a web page's original appearance depends. An online integrated development environment for programming languages like PHP, C++, Ruby, Java, C# and Visual Basic. 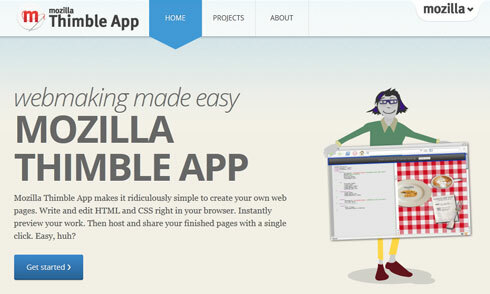 Allows you to write and test HTML and instantly see how your new code will look on the web. On one side of your screen you will see your code and on the other side you will see how your code looks on the web. When you're ready to share your new code with the world just click "publish" to have a web address created for your page. A cloud solution for coding in Action Script 3. It’s a useful sandbox for cloud Flash development with an emphasis on gaming and a strong community aspect. Much like Yahoo Pipes, you can begin your project by forking one of the many templates available to the user base, or you can write your Action Script from scratch if you prefer. The results can be downloaded and saved to your desktop for further modification. Lets you develop applications for Android phones using a web browser and either a connected phone or emulator. The App Inventor servers store your work and help you keep track of your projects. The Corona SDK is a framework (made by Ansca Mobile) that allows you to develop iOS and Android apps/games much faster than you would be able to if you were to go the “default” route (Objective-C and Java).How does it do this? In short, by allowing you to use a relatively simple, easy-to-learnscripting language called Lua. Comprehensive list of sites to learn programming online. Non-profit foundation dedicated to growing computer programming education. The site Made with Code was started because even though increasingly more aspects in our lives are powered by technology, women aren’t represented in the companies, labs, research, creative arts, design, organizations, and boardrooms that make technology happen. Tomorrow, we can make that number go up." Taught by regular Stanford faculty and are highly interactive. Enrollees do not get Stanford credit for their work, but they do receive a statement of accomplishment if they successfully complete a course. The classes are delivered on a number of different platforms. Learning Python in a Browser. Introduces programming to beginners: 25 lessons run from "Hello World" up to recursion. We focus on user-friendliness and alternate expository text with a variety of exercises, including auto-graded programming exercises and drag-and-drop "code scrambles." You learn to code on screen (in a browser). Right now supports the Ruby language. A company that offers free online courses in computer science. The company currently offers two introductory programming courses — one for students with no previous background in the subject (CS101: Building a Search Engine), and the other for students with no actual programming experience (CS 373: Building a Robotic Car). Eight additional classes are planned for 2012. While students who complete the courses can receive “a certificate signed by the instructors,” Udacity offers no formal credentialing or certification, and no formal academic credit. The purpose of The New Boston is to share instructional videos and tutorials in the areas of computer science, computer programming, mathematics, science, robotics, and much more. Think of The New Boston as Khan Academy for computer science. For students who are interested in programming, The New Boston offers an active discussion forum in which they can ask questions. Currently the list contains 150 free eBooks, everything from Office to Visual Studio.